Social Media advertising is a great way for photographers to get the kind of leads that fuel their business and drive revenue, and right now Facebook is one of the cheapest and most powerful platforms currently available. 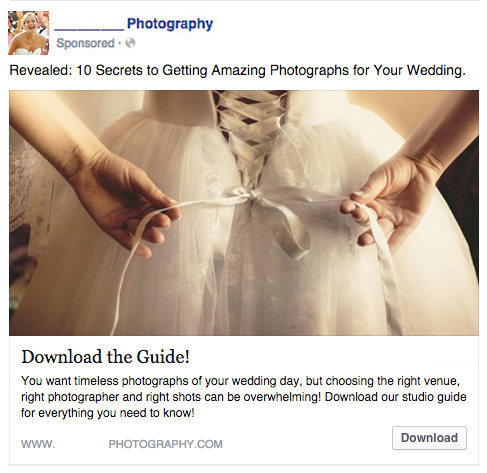 The problem is that many photographer struggle with creating ads that convert and bring valuable clients in the door. 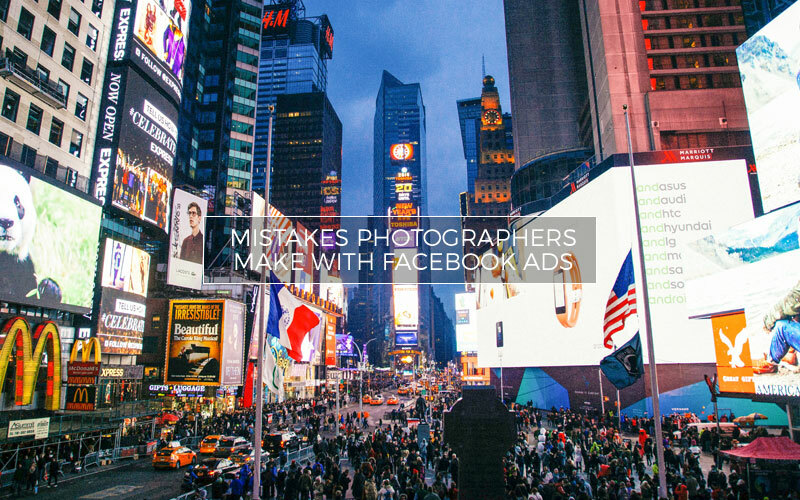 There are lots mistakes that I see photographers making when using paid ads on Facebook, from targeting to messaging and understanding the difference between an ad and a boost; but underneath all of that is a larger issue that has to be addressed: Too many photographers are trying to advertise to people who have never heard of them and are expecting to drive quality leads. Instead, they launch their ads to the sound of crickets, or get a flood of clicks that don’t convert. 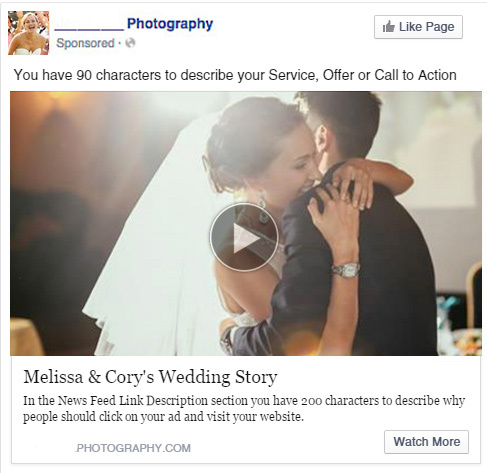 Creating ads asking for the sale before you’ve wooed a prospect is the crux of why ads on Facebook fail to perform. So today I want to share some strategies that I employ, both as a photographer and in my role as a digital marketing specialist, to give you a new perspective of how Facebook Ads can help drive a steady stream of valuable leads to your business. My hope is that you’ll feel empowered to create the kinds of killer ads that you need to compete in an increasingly noisy digital space. So what exactly is wrong about advertising to new people and asking for a sale? Now before you email me, chastisingly reminding me that, “Jen, finding new leads is kind of the point of advertising” let me explain. 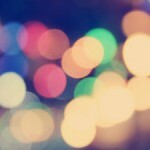 Imagine yourself at a big cocktail event filled with all kinds of people that you’d love to work with. What would you think of a person making his way around the room, handing out his business card to people before he’d even been introduced? Unfortunately that’s what it’s like when you’re running an ad on Facebook, expecting a sale before you’ve been properly introduced. If you haven’t provided value to the people that you’re getting your ad in front of, what is it that’s going to make a potential client want to work with you over someone else? Now let’s reimagine this cocktail party scenario. You’re participating in the conversation, engaging with your fellow attendees, and someone happens to ask a question that falls into your area of expertise. 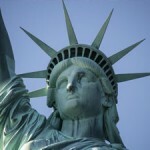 You light up and provide helpful, relevant answers with no strings attached. Not only is the person who asked the question pretty impressed, but so are a few others who’ve been participating in the conversation. Then comes the magic question: “Do you have a business card?” You do, in fact, have a few tucked into your wallet. And, you happen to mention, there are a few more helpful resources on your website in case anyone else has any questions on the topic discussed. By providing value you’ve developed, what we call in marketing, the know, like and trust factor! So, how do you translate this into your Facebook Ads strategy? The answer is: provide value first. Before creating an ad that asks for the sale, make sure that you’ve wow-ed your potential audience with so much value that they can’t imagine booking with anyone else. In order to do this, you have to do a little bit of reverse engineering, and understand what it is that your prospect is looking for at each stage of their exploration and research prior to booking. So if you’re a wedding photographer, let’s play this scenario out with your potential bride or groom: When a couple gets engaged, the likelihood is high that they’ll be looking for a wedding photographer. 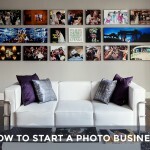 But before you jump in front of them with ads that are akin to that unsolicited business card at a cocktail party, let’s think about what their questions and needs around finding a photographer might be. If you can identify those needs and questions ahead of time, then you have the edge to get in front of those couples and provide them the with answers to their questions in the form of ads that lead them to great downloads or helpful blog posts. What is your Customer’s Journey? In the above example timeline, we’ve identified that this potential bride has gotten engaged and set a wedding date of about a year out. At this stage, couples tend to be looking for inspiration, so this is a perfect opportunity to offer something of value that addresses the couple’s needs. Perhaps you could run a “Like” campaign, promising inspiration and planning tips that you share regularly on your Facebook page. Think of how your expertise can lend itself to the needs of your potential client at this stage; and if you run a Facebook Ad at this stage, how to do you offer value? Running a “Like” campaign isn’t about “buying followers.” We’re not looking to increase the number of likes on your Facebook page as a vanity metric (although Likes are a great way to offer a little bit of social proof). Instead, we’re trying to grow your audience so that you can offer both organic and advertised content in the future. Once a prospect is familiar with you, we can move on to the next step in the timeline. In our example timeline, we now have a bride that has begun to think about photography, but she could potentially be overwhelmed with choices and questions. It’s time for you to dive deeply into the psyche of your ideal prospects, or give a call to past clients and do some research! What kinds of questions kept your former client up at night, and how were you in the perfect position to have answered those questions? Chances are these are the same questions, and solutions, that you can provide to prospects. In order to create effective ads, and content/offers that you will be promoting in those ads, make a list of the questions that you’ve determined prospects and past clients had in their journey towards booking. You may have to spend some time working backwards in your memory with past clients to determine what their biggest pain points were in trying to determine their photography needs, but once you do this you’ll have a powerful list of content ideas. Once you’ve determined the content that provides the dream answers for your prospects, it can live on your website, you blog, be delivered via an email campaign, or exist in a PDF that’s delivered as part of the Facebook Ad Conversion. Feel free to be creative here; you can dream up anything as long as it offers solutions to the problem that your potential client could be facing in their customer journey. Don’t worry about creating something that delivers all of the answers all at once. Break things up into bite sized pieces so that you don’t overwhelm your prospect, and then deliver that information over your prospect’s journey as they progress through their timeline. By positioning yourself as your prospect’s guide and an expert who is available to give them answers, not only are you consistently providing that value that we talked about before, but you’re also creating that all-important know, like and trust factor. An example of an ad that could provide value to your prospect. 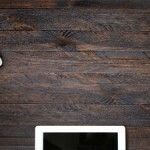 Now that prospects are engaging with the content that you’ve provided, it’s time to introduce your brand and services. Yes, technically we’ve been doing this all along by creating branded content that answers your prospect’s questions, but until this point we’ve been pretty mum in terms of the exact services you provide. We’re still not at the point of expecting a sale, but we’re taking that next step towards getting a prospect interested in the services that we offer that meet their needs. 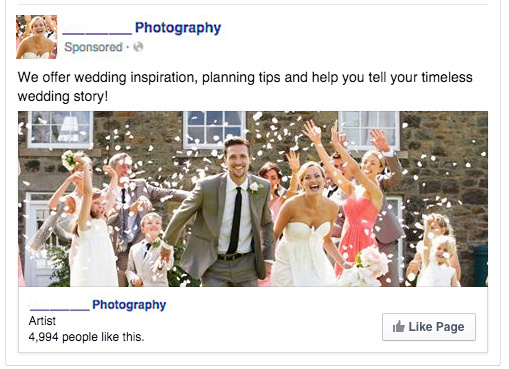 From a Facebook Ads perspective, this could be a boosted post that leads to a blog post showcasing the latest wedding you’ve photographed. Or, if you have a brand video that tells the story of your services, this is the perfect point in your prospect’s timeline to introduce them to it. We want them to begin thinking, “Yes, that’s what I want!” So think about what you can showcase that will get your prospect excited about the idea of working with you. Once you’ve consistently offered value to your prospects, they know, like and trust you, you’re finally ready to ask for that sale. This is where you can create an ad that offers a promotion that is directly related to your services. If you’ve been promoting content that is helpful and engaging, you should have no trouble converting those prospects into leads. Create ads that explicitly describe your offer, your value proposition and a strong call to action. You’ll have 90 characters to describe your services and offering, as well as 200 characters in the News Feed Link Description section. Use these wisely and to your advantage to compel your primed prospects to book with you! Once you have engaged with prospects that are familiar with your value, you’re now ready to utilize the power of Facebook Ads to generate bookings! 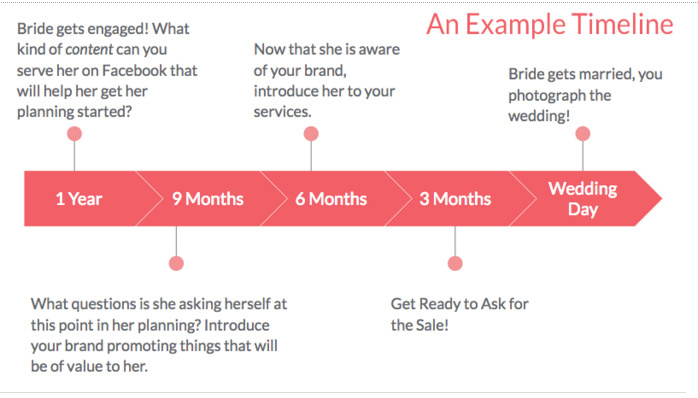 If we think back to that initial timeline, it’s important to remember that your prospects are on a journey of discovery, and if you’re willing to be a part of their journey you will have an amazing opportunity to engage them through Facebook Ads. 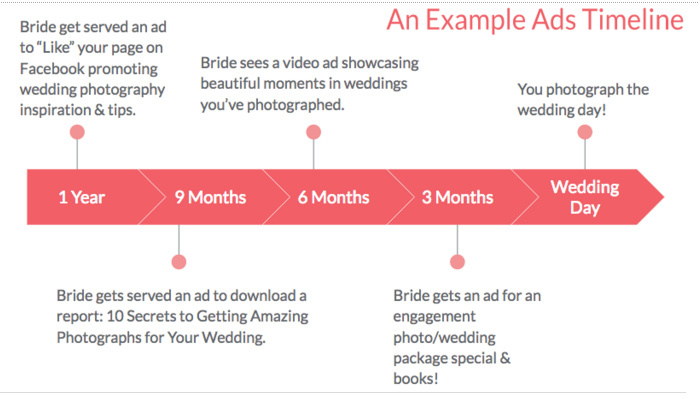 Now that we’ve walked through a sample journey, we can take the various types of ads that we discussed and overlay them over that previous timeline. As you can see, getting a couple to book a wedding takes multiple touch points. The same can be said for booking any kind of photographic service. So while you may occasionally get a lead from running a Facebook Ad that is asking for the sale right away, chances are that if you craft your strategy to involve those multiple touch points, developing the know, like and trust factor, you’ll have greater success and more engaged prospects who are excited at the idea of being able to book with you. 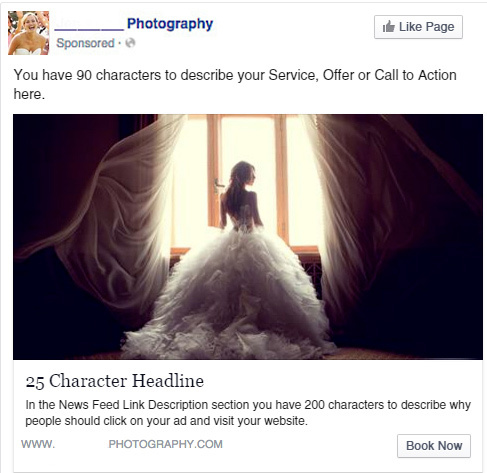 Continue to Part 2: How to Rock Facebook Ads. 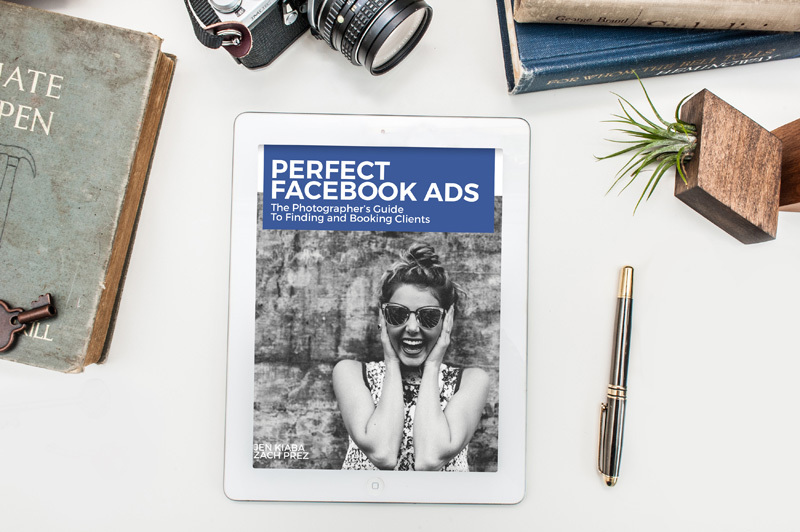 Our 149-page ebook helps you plan an effective ad strategy to find perfect potential clients at the lowest cost. It goes way beyond what to put in your ad, although we do cover that. You will learn how to attract the right person at the right time with the right ad. Our examples and formulas make it easy. 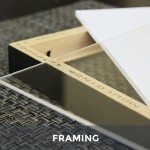 Your business needs are as unique as your photography. We show you how to use Facebook’s options to create a tailor-made marketing campaign perfect for you! Jen Kiaba Barry is an award-winning fine art photographer, educator and digital marketing specialist at DragonSearch, based in the beautiful Hudson Valley, NY. Her photography has been published internationally in magazines and on book covers. To see more of her work, visit jenkiabaphotography.com.